CAN THE MUMBAI INDIANS TAKE THEIR REVENGE??? Both teams are coming off good victories against the Sunrisers Hyderabad. 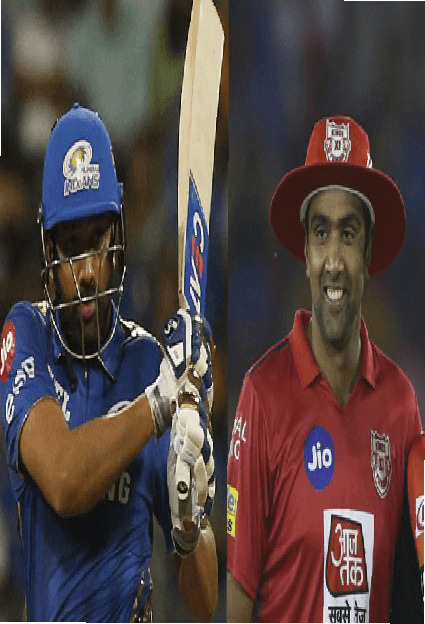 The Mumbai Indians won a game that they were supposed to lose and the Kings XI Punjab almost lost the game that they were supposed to win comfortably. The Mumbai Indians will be very confident after winning consecutively against two top teams in CSK and SRH. In their previous encounter at Mohali, the Kings XI Punjab won comfortably with 8 wickets in hand. Quinton De Kock scored a fifty and Hardik Pandya had finished the innings with a blitz but it was not enough as KL Rahul, Gayle and Agarwal took them out of the game. Out of the 23 matches played between the two teams, it’s been almost neck and neck with the Mumbai Indians winning 12 matches and Kings XI Punjab winning 11 matches. At Mumbai, both teams have had 4 wins each. Rohit Sharma, for the Mumbai Indians, is the most important player for them but has failed to get going so far in this tournament. He has got starts but has thrown away his wicket on a few occasions. He will be looking to get amongst the runs as Mumbai need runs out of their captain to win this tournament. Chris Gayle, for the Kings XI Punjab, has missed out in the last two innings. He has been in good form leading into the IPL and will be looking to create a big impact in this tournament as he always does. The Mumbai pitch will also help him with the ball coming on to the bat on a small ground. The Mumbai Indians will have Malinga back, but will be a tough call to replace either Alzaari Joseph or Jason Behrendoff. The Kings XI Punjab are unlikely to make too many changes after their win. The pitch at Mumbai is expected to be batting friendly and is expected to produce a high scoring match. There might be some assistance for the pace bowlers early on but will then come on to the bat nicely. The Mumbai Indians, playing at home will start as favorites for this match. They have been on a good winning momentum in the last two matches and look like they have a good balance in the team with Pollard coming back to form and the bowlers hitting their marks. Hence, it will be difficult to beat the Mumbai Indians at home. The Mumbai Indians should look to get KL Rahul and Gayle out early on. They were not able to do that in the previous game and hence lost the match. Alzaari Joseph who didn’t play the previous game can be the X-factor with his extra pace. The Mumbai Pitch will provide some movement early on and will have to utilize this to get the two batsman out. To KL Rahul in particular, they should try and cut the singles as he has decided to play the anchor innings and hence looks to just rotate strike for most part. The Kings XI Punjab on the other hand will know that the Mumbai top order has not really been performing very well. They have to continue to put that pressure on the top order and should restrict Hardik Pandya and Pollard from geeting away towards the end. They should look at starting with Mujeeb Ur-Rahman or Ashwin to the Mumbai openers who like the ball coming on to the bat. Can CSK stop Russell and team??? Warner & Bairstow vs Rahul & Gayle - Who will win??? Prediction Here - Will RCB be able to get their first win ??? Should BCCI rest Kohli from IPL for World cup? Can Local boy Ashwin rise above the Local team CSK??? Prediction - RCB will win against KKR and end their losing streak??? Can Delhi Capitals come back after Major Collapse??? Prediction here!!! Two most successful Teams playing each other!!! Find out who will win!!! “Maybe the RCB should try it in the 12’s “!!! Can RCB silence critics??? Rabada got Russell, Can he get Gayle??? Can CSK get 3 wins in a row??? After 2 back to back loses, Can RCB win the third game? Can Russell do it again?? ?Karthik vs Pant!!! Two Teams Coming off No-ball controversies!! !Who will win?